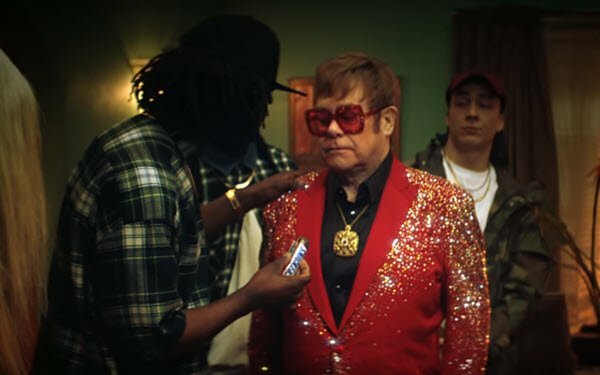 Snickers is making its first musical play for cross-generational appeal by pairing Sir Elton John and popular rappers for the brand’s latest "You’re Not You When You’re Hungry” TV and online ad. The ad (60-second version below), from the U.K.’s AMV BBDO, is set at a house party during a rap battle. U.K. rapper Femi Nylander intercedes by having “John” eat a Snickers — whereupon John dissolves into the real performer underneath, U.S. rap star Boogie. The ad, which also has a 30-second version, will debut on U.S. television next week and will also air in the U.K., Germany and Russia. Several previous ads in the campaign also employed older stars to engage both boomers and younger generations. Examples have included the campaign’s original, wildly popular Super Bowl spot featuring Betty White and Abe Vigoda scrimmaging with NFL players, and a 2011 ad featuring Aretha Franklin and Liza Minnelli on a car trip with some young guys. But the new ad also leverages the power of music. “We’re always looking to reach the broadest swath of the population, but we can’t ignore the growth of the millennial and Gen Z audiences, and we recognize the role that music plays in their lives,” Dale Green, global brand director for Snickers, told Variety. 1 comment about "Elton John Takes On Rappers For Snickers". Jerry Gibbons from Gibbons Advice, August 31, 2018 at 10:44 a.m.